When it starts to appear in the grocery store in late September, I become obsessed. All I want to do is buy it all, cook it, and dig in. And repeat. 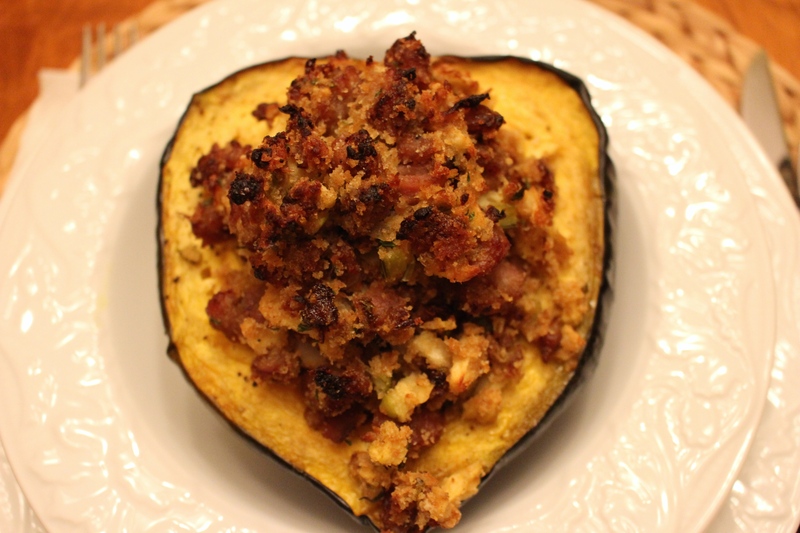 While I love simple baked acorn squash, my friend DK actually gave me a recipe for STUFFED acorn squash a few years ago that took my favorite fall side and turned it into a meal. Needless to say I tried it the same night she gave it to me and have been in love with it ever since. 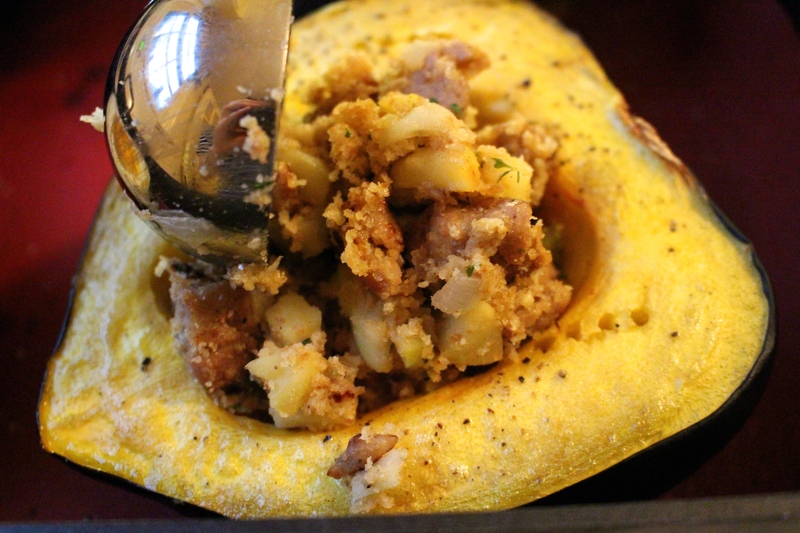 This dish is the perfect combination of fall flavors – squash, apple, and sausage. Basically, it is October in a meal. It starts with two acorn squashes that have been washed thoroughly, dried, and cut in half lengthwise. Scoop out the seeds and set the halves cut-side up into a deep-sided baking dish (I used my roasting pan) lined with a silicon baking mat or with some parchment paper. I brushed the cut-sides of the squash with melted butter and seasoned it with salt and pepper. I popped the roasting pan into a 400 degree oven for about 1 hour until the squash is just tender. While the squash is roasting in the oven, you have plenty of time to whip up the stuffing. In a large high-sided skillet set over medium-high heat, throw in one pound of sweet Italian sausage – I can only find sweet Italian sausage links at my grocery, so I just slit the casing and peel it off before tossing into the skillet. If you can find bulk Italian sausage though, grab that and use it! Cook the sausage until it’s all crumbled and brown. Drain the sausage in a colander to remove the excess grease and transfer them to a plate and drain any excess fat from the skillet. Place the skillet back on the heat, turn it down to medium, and add in about 2 teaspoons of olive oil, some finely diced onion, and finely diced celery. And I threw in a couple sprigs of fresh thyme – it adds a bit of herby freshness to all the rich fall flavors. I cooked the veggies for a couple minutes until they become tender and start to become golden. Then I threw in some finely chopped apple (that has been peeled first) – I used one gala apple and one granny smith, but any firm apple works here! Sauté the apples and veggies for another couple minutes until everything is soft and tender. Then turn off the heat. And toss in the cooked sausage and some seasoned bread crumbs to the veggie mixture and stir to combine. Taste the filling and add salt and pepper to taste. Then stir in one beaten egg. Set the filling aside until the squash comes out of the oven. When the squash is tender, pull it out of the oven. Fill up the cavity of the squash with the filling. Lightly pack the filling into the cavity, but don’t pack it down too much – if the filling is too compressed, it becomes too dense and doesn’t cook through (raw egg is not awesome). Pop the squash back into the oven and cook the squash until the filling is cooked through and golden brown. All that you need to do is plate up and chow down. This is definitely a fall dinner winner (say that three times fast!). I hope you enjoy this recipe, kiddos. Preheat oven to 400 degrees. Line the bottom of a high-sided roasting pan with a silicon baking mat or with some parchment paper. For the squash: When the oven is at temperature, place the squash halves in the pan, cut side up. Brush the cut sides of the squash with the melted butter and season them with salt and pepper. 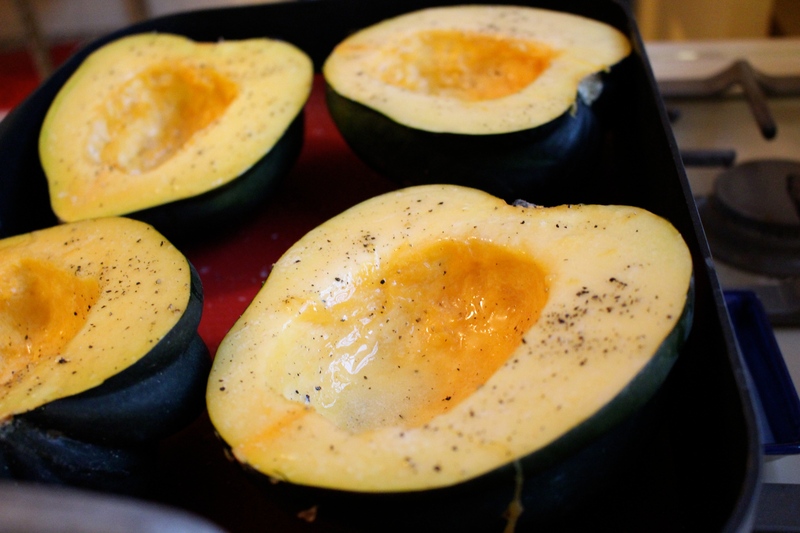 Place the pan into the oven and roast the squash for about 1 hour or until the squash just become fork tender. In a high-sided skillet set over medium-high heat, toss in the sausage and cook until crumbled and browned, about 5 minutes. Remove from the heat and drain the sausage in a colander. Place the sausage on a plate and set aside. Drain the grease from the skillet. Place the skillet back onto a burner set to medium heat and add in the olive oil. When the oil become hot, add in the onion, celery, and thyme. Cook the veggies for about 2-3 minutes until they are soft and turning slightly golden brown. Add in the chopped apples and continue to cook for about 2-3 additional minutes until everything is soft and tender. Remove the skillet from the heat. Add in the sausage and the breadcrumbs. Stir to combine – taste for seasoning, adding in salt and pepper to taste. Stir in the beaten egg. Set aside until the squash is finished roasting. Remove the squash from the oven. 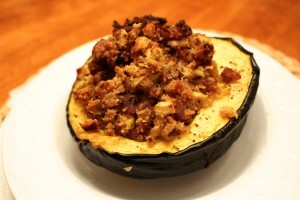 Fill the cavity of the squash with the stuffing. Place the pan back into the oven and bake for about 20 minutes until the filling is golden brown and cooked through. Serve immediately to hungry family and friends!